Banking during the 19th century was conducted on a small and local scale. A bank would have a large head office with five or six smaller branches in a particular region. 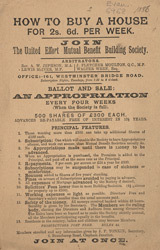 Mutual benefit and friendly societies were officially recognised in 1836 and were particularly popular in the north of England. Every area had their own financial institutions and each firm was independent from one another. This meant that banks relied on local economies. The main type of business for banks at this time comprised deposits and withdrawals, with far fewer loans or mortgages than today.